Some parents inadvertently fall into the misguided notion that because they are endeavoring to live a Christian life and raise a Christian family that their family life will be sunshine and roses. * Not true. Christian families face the same struggles as other families, indeed perhaps they face additional temptations and trials than other families in our society. Your commitment to raising your children in God's ways is good and right and the path to the narrow gate (Mt 7:13-14) This path is much more difficult to navigate. The beauty is that you have an ever-faithful, all-loving, all-powerful, all-knowing, ever-present God sustaining you every step of the way. He doesn't ask you to be the perfect parent(s). That is impossible, because you are imperfect. He only asks that you try your absolute best to be obedient to His Word, faithful and persevering in your walk with Him. Leaning not unto your own understanding (Prov 3:5-6 ), pondering His Will in your lives (Lk 2:19) and trusting Him who will bring good out of all things (Rom 8:28). For He knows the plans He has for you, plans to bless you...(Jer. 29:11). Since the beginning God used all kinds of imperfect parents and families to bring about His plan for our Salvation. One of the most poignant was when Joseph was sold into slavery by his jealous brothers. What appeared to be complete tragedy and disaster from every angle (parents lost their son, brothers entered into evil and shame, Joseph's life was no longer his own and separated from his family--a slave and even unjustly thrown into prison for three years). It all seems too horrible to consider the existence of a loving God...until you get to the end of the story. God had allowed all that temporary pain and misery in order to save the family from starvation and death in the great seven-year famine! Granted, it was likely not His "Plan A" for Jacob's family. When Joseph's brothers gave themselves over to their jealousy, however, God ran with "Plan B." Our visions, our plans, our expectations, are so limited compared to what God has in mind for us, but if we insist that our will be done, in His Divine Love and Mercy, He will allow it and then work all things to our good. He alone can draw straight with crooked lines. So your Christian family's life isn't perfect? Congratulations, you're human! Breathe. Smile. Laugh more at life's absurdities. Keep moving forward one day at a time. Hand over your family and your life and your will every morning to your Heavenly Father through Jesus Christ, who will send the Holy Spirit into your heart to sustain you, enlighten you, give you the Grace and wisdom you need to face whatever challenges you will face that day. Seek His Wisdom in daily Scripture reading (life's instruction manual). Spouses consider doing these things together whenever possible to strengthen your walk together with the Lord, which is the foundation of family life and marital love. It also can be helpful at times to generally acknowledge to your pastor, your child's teacher, the principal, or other confidential person of faith, a particular struggle you may be having at home. The next time one of these trusted people asks you how you are doing, try giving them an honest answer like, "Thank you for asking. If you have a minute I'd like to share with you something I've/we've been struggling with lately..." Perhaps they'll have an insight, or you could just ask them to keep you in prayer. Either way, we never have to walk to the narrow gate alone. There is no shame in having difficult problems. On the contrary it's an opportunity to build the virtue of humility (to tear down your pride). On the cross, Jesus took all the shame out of brokenness, when He became brokenness out of Love for us. Then just three days later, He enraged Satan and revealed to us the glorious triumph of the Resurrection! Remember: no matter how bad things seem to get, like Joseph, like Jesus, triumphant Resurrection is the end of our story, too! 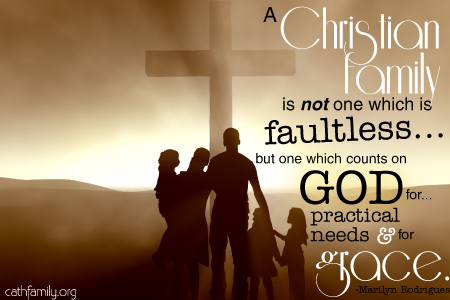 *Imperfections in Christian families is a specious argument tossed out as a criticism by anti-Christians in the media and elsewhere. Do not be intimidated by this. Keep in mind that for those who supposedly don't believe in God/moral standards, anything goes, so they can't be criticized...again, supposedly, but that topic will have be addressed in a separate post, so you can be prepared to answer this fallacy with Truth (2 Tim 4).